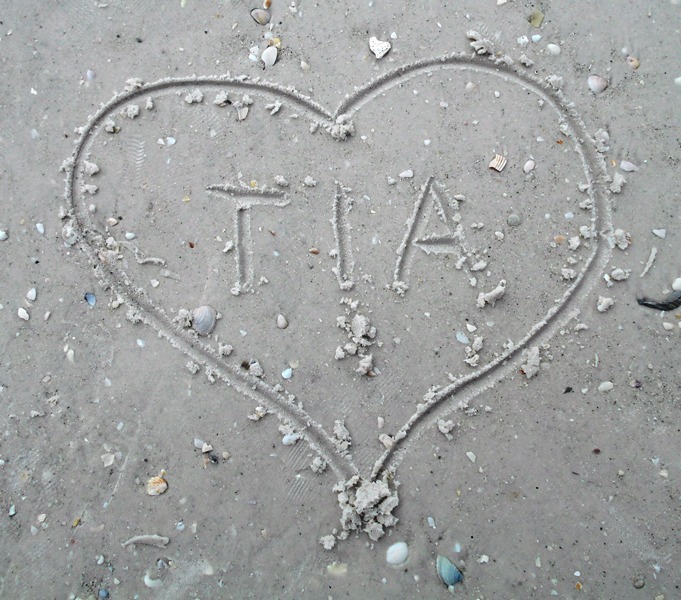 Weekly BLOG: How Would You Spell TIA? Last week you saw the picture of Tia; did you know that her name comes from the initials of The Inside Advantage? Sweet Tia has stories to tell and ideas to share; so far two booklets are planned (each is 32-pages in full color). They are inspirational, uplifting, and for kids at heart; I’ll share the titles and more details about exciting things coming later this year. For now, are you ready for some fun? Simply think about all the different creative ways you could display the letters TIA. I hope you will take a few minutes and put together these three letters in fun and creative ways, then email your photos to me (see my website CWLauro.com for the address). Feel free to send more than one idea. See this blog photo to give you an idea — something like what I did this week in Sarasota, Florida (sunny and 76 degrees!) by writing her name in the sand at the beach. It doesn’t have to have a heart around it, but it certainly can. Have fun with it! Please show me what you come up with; by sending photos to me means that I have your permission to use them. Include contact info and let me know if you want your name associated with your photos. This entry was posted in Touch a Heart with TIA and tagged Cathy W. Lauro, finding joy, inspiration, living deeply, The Inside Advantage, Touch a Heart with TIA. Bookmark the permalink.